On the gorgeous Queen Charlotte Sound, the picturesque seaside town of Picton, New Zealand is the main ferry port for New Zealand’s South Island. It is also a popular port of call for cruises due to the amazing hiking trails in the area, access to a scenic sheltered bay, and the nearby Marlborough wine region. A day in Picton could mean kayaking out in the Queen Charlotte Sound, swimming with dolphins, tasting some of New Zealand’s best wines, or exploring the many nature trails. You can have an amazing day just walking through the trails, without spending any money. The hikes around Picton range in length from 30-minutes to 3-days. We visited Picton by cruise ship and had a limited time to explore – this is how we made the most of our 8 hours in Picton! The cruise ships dock in the commercial port in Shakespeare Bay. Being a commercial port, you need to take the free shuttle out of the port area. The bus drops you off right at the heart of the small town of Picton by the visitor information center (i-Site). All of the hikes are within walking distance of the town. The Tirohanga Track takes you up above Picton for a spectacular view of the fjord and the city below. The trailhead is just a few blocks away from the center of town, at the end of a residential street. Head east down Waikawa street and turn right at Newgate street. There will be a sign saying “Tirohanga Track” just above the street sign. The trail start is just a bit down the street to the right. The trail is 1.2km each way and takes 40 minutes on the way up, a bit less on the way down. It is a peaceful walk through the native forest with a gradual ascent. You won’t be disappointed with the view from the top. For a longer hike, continue on after the observation area and you will end up at Garden Terrace. You can then walk back to town from there. You can also head back down the way you came. Along the way, you will see many traps trying to catch invasive species. Prior to humans arriving on New Zealand, the islands had no land mammal species. The country was just populated with birds, a few bat species, and marine life off the shore. The Maori people brought dogs and rats. Then the Europeans brought unintentionally brought pigs, mice, more rat species, weasels, ferrets, and possums. Nowadays, the local New Zealanders are working to eliminate their rodent populations. Their goal is to eradicate all invasive species (besides the animals they brought for agriculture and pets) by 2050 to protect their native bird species. Along all the trails in the area, you will find small wooden cages set out to catch the rodents. The expansive Victoria Domain overlooks Picton Harbor and Queen Charlotte Sound. This forested nature reserve has numerous interconnected walking and biking trails. 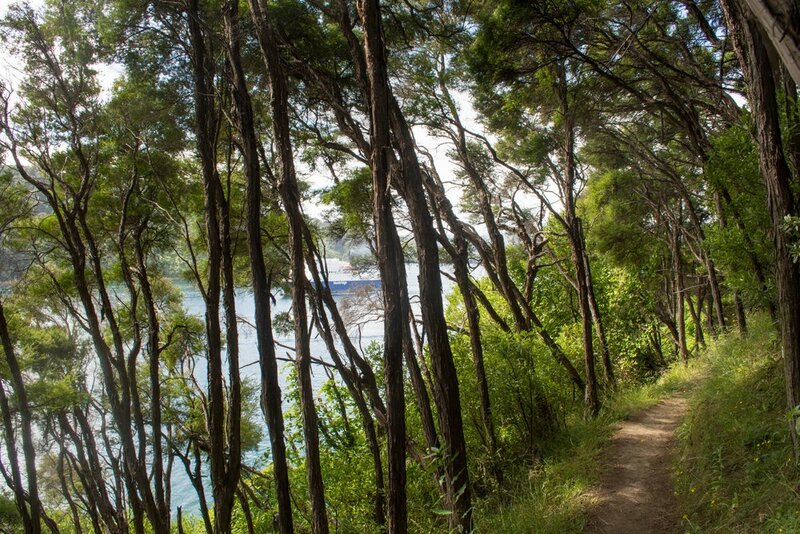 The two most popular trails are the Upper and Lower Bob’s Bay Trail that meet up at the end to take you to Bob’s Bay, a secluded beach area in the Queen Charlotte Sound. You can take one trail on the way there and the other on your return trip. We decided to start with the Upper Bob’s Bay trail and head back to the city on the Lower Trail. From the Tirohanga track, head toward the Picton Marina and cross the tall footbridge. After the bridge, go to the left and look out for the trailhead on your right side. You will find many signs along the trail directing you to Bob’s Bay. The path moderates up and down with gradual and steep sections. Occasionally, you will be able to sneak views out to the water, but most of the walk goes through a regenerating forest. The total return time on the trail is one hour, but you might want to spend more time chilling on Bob’s Bay. At Bob’s Bay, you can swim off the beach, enjoy a picnic, watch the boats in the harbor, or laze around on the beach. Head back across the bridge toward the Picton Memorial Park which sits right on the bay. This might be one of the most tranquil and scenic parks we’ve visited. Sit on a bench or the lawn and take in the view. Ferries regularly come in and out of the port every 15 or so minutes. Grab take-out from one of the restaurants across the street and have a picnic. You can also walk along the water, play at the playground, or swim at the hot pools. The park is also connected to the Picton i-Site (visitor information) where you can learn more about the area or catch the free shuttle back to your cruise ship. Edwin Fox Maritime Museum – This museum houses the preserved Edwin Fox boat – a 162-year-old boat that carried convicts to Australia, brought immigrants to New Zealand, and carried troops to the Crimean War. It is considered the 9th oldest ship that is still intact. Museum entry costs NZ$15 per person. Wine Tours – Picton is just a short drive away from the heart of the Marlborough wine region – home to New Zealand’s most famous wines. There are many different companies that offer half or full-day wine tours for cruise passengers and other visitors. The most popular varietals are Sauvignon blanc, Pinot noir, and Chardonnay. Kayak in the Queen Charlotte Sound – Enjoy the waters around Picton and the marine life below its surface from Kayaks. There is so much to see around the sheltered bay only accessible if you are out on the water. Marlborough Flyer Train – The Marlborough Flyer is a heritage Steam Train that passes through beautiful scenery between Picton and Blenheim. SO, NOW YOU KNOW THE DEAL, START GETTING INSPIRED WITH SOME OF OUR GUIDES TO NEW ZEALAND OR HEAD TO OUR NEW ZEALAND PAGE!